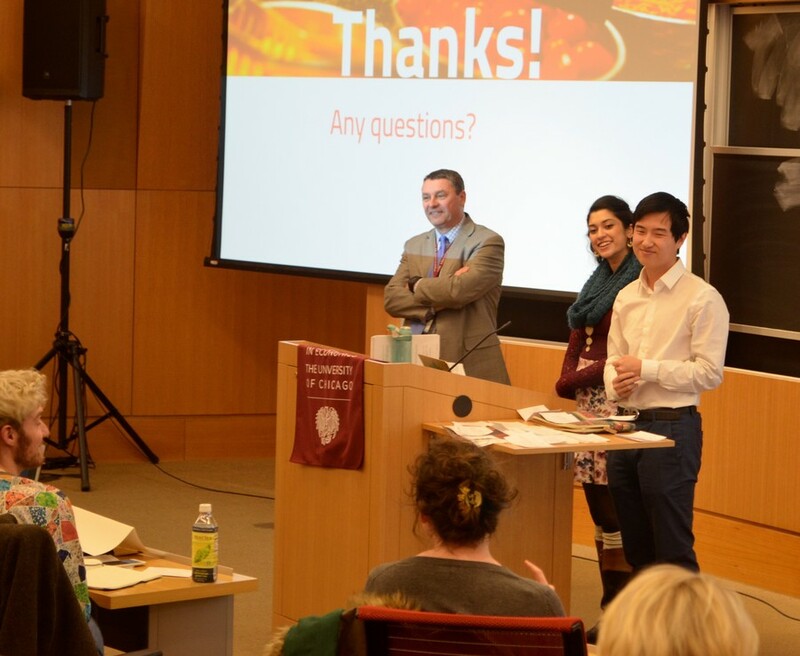 At a town hall on Wednesday at Saieh Hall, the University’s Campus Dining Advisory Board (CDAB) and representatives of UChicago Dining discussed the expiration of Aramark’s contract and proposals from Sodexo and Bon Appétit, two alternative food service providers. At the Town Hall meeting, CDAB and Student Government (SG) members Megha Bhattacharya and Michael Meng discussed food safety and the University’s process of renegotiating its contract. The board presented sections from the University’s Request For Proposal (RFP) process, through which the University gives companies an opportunity to bid for the contract. All providers submitted proposals on January 27. CDAB also explained that they and Dining are searching for a provider with a commitment to cleanliness, customer service, and the ability to consistently supply healthy, high quality food to the Bartlett, Cathey, and Campus North Dining Halls. The CDAB members, Executive Dining Director Richard Mason and Assistant Director of Dining Operations Stacey Brown, then discussed the selection process. After reviewing proposals, they will invite the companies back for interviews on February 23 and 24. Following the interviews, they will do site visits at Northwestern University, which maintains a contract with Sodexo, and Wheaton College, which has a contract with Bon Appétit. Dining primarily sought contracts with providers that are located in Illinois so the University can continue to locally purchase at least 40 percent of its produce. Dining and CDAB will compile the information that they gathered and make a recommendation. That recommendation will then be sent to Vice President for Campus and Student Life Karen Warren Coleman and senior administration for the final part of the decision-making process. The chosen vendor will have the same dining responsibilities as the current vendor but will not be responsible for the Booth School of Business and the University of Chicago Medicine, because those institutions still have a separate contract with a different division of Aramark. After the initial discussion, CDAB members Mason and Brown conducted a Q&A session in which they collected students’ comment cards and addressed concerns about food safety, transparency between the student body and Dining, and the contract renewal. Among the student body were eight members of the Fight for Just Food movement, a new organization that favors an in-house, self-operating food service instead of a contract. Some students, including the Fight for Just Food members, were concerned about the choice between self-operated dining and the University’s decision to remain on a contract. For the University, self-operation would entail not only purchasing food but hiring staff to cook it and repairing equipment each time it is damaged as well. Currently, Aramark is responsible for repairing any of the equipment that the University originally purchased and for supplying plates and eating utensils. Mason also explained the history of the University’s switch to a dining contract in 1989 and gave several reasons for maintaining this contract. “Since then, there has been an increasing percentage of schools that have moved from becoming self operated to contracts, because there are issues around purchasing, training, and also capital investment, so that’s a big part of the issue… And there are challenges securing safe food, which has obviously been in the news and is very difficult to maintain, and that’s just one example,” Mason said. Third-year Fight for Just Food member William Thomas believes that the University should consider self-operation instead of potentially signing with companies that he says both profit from prisons and provide low-quality food. “Aramark, Sodexo, and Compass Group, which is Bon Appétit’s parent company, all profit by serving terrible food in prison. Profit is one of the driving forces behind mass incarceration: the more people we put in cages, the more money Aramark and other prison food service providers make. Furthermore, Aramark has a record of serving inadequate, rotten, and maggot-infested food to prisoners,” Thomas said. As the meeting drew to a close, Meng reinforced CDAB’s and Dining’s objective of equally judging vendors despite receiving overwhelming feedback from students who would prefer to discontinue a contract with Aramark. “We will just have to judge them holistically—judge them and consider different factors because you can provide the very best food, but if it’s not cost feasible, then it just won’t work. But luckily, there are only three, so I definitely think we can find what’s best for the UChicago community,” he said. Meng also addressed the reason that the University has maintained its contract after failing city health inspections twice and closing Cathey Dining Hall as result, and after dealing with several dining hall incidents. “I think the reason we’re here, at this point now, has a lot to do with our responsiveness to these issues... I think that if we carefully review these applications and strongly consider that we can find another food provider, then we’ll be in good shape. If things do happen again, then we’re right where we were, but I hope we can make a decision this time around that’s good enough,” he said. “When you’re serving over 1.3 million meals, unfortunately, with all the steps we’ve taken, unfortunate things like the screw happen, and it doesn’t mean that it should happen, but it can.... The ultimate thing is, do you cancel a contract? Do you cancel a contract over a screw? Do you cancel a contract over closing a dining hall? [Canceling the contract] is certainly something that was very strongly considered,” Mason added. CDAB members reinforced the importance of transparency between the student body and UChicago Dining. SG representative Battacharya stated her hope that the town hall meeting is a beginning for CDAB, Dining, and students to voice their opinions freely amongst each other. “Part of the process is that we are starting right now…. We are trying to make sure that the student body is aware of the process, what role we play in it. That’s why we provided that comprehensive timeline, and we hope to update you guys as the process continues,” she said.